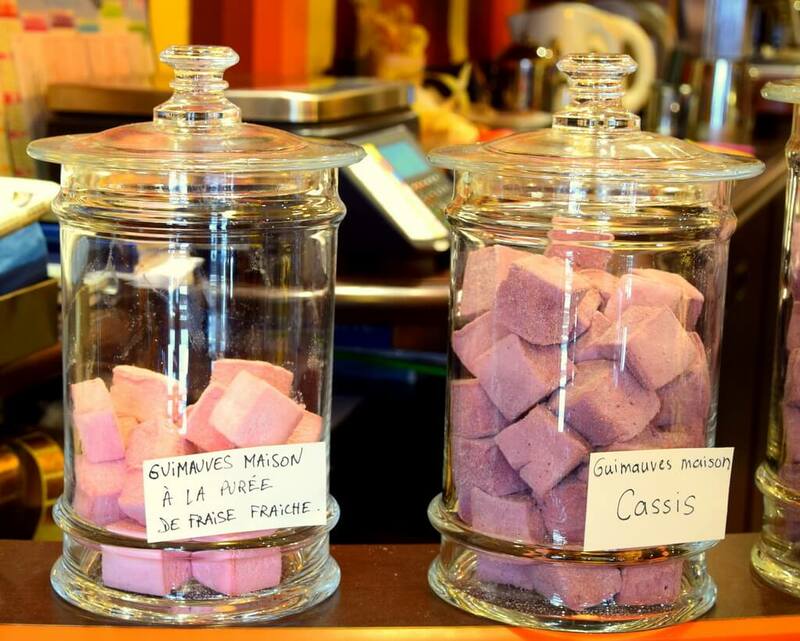 Do you know what is the best time to visit Bayonne, the French chocolate capital? According to me, it’s during its chocolate days! Because who doesn’t like chocolate? Want to know if you can taste this Basque speciality and a few other ones on this occasion? 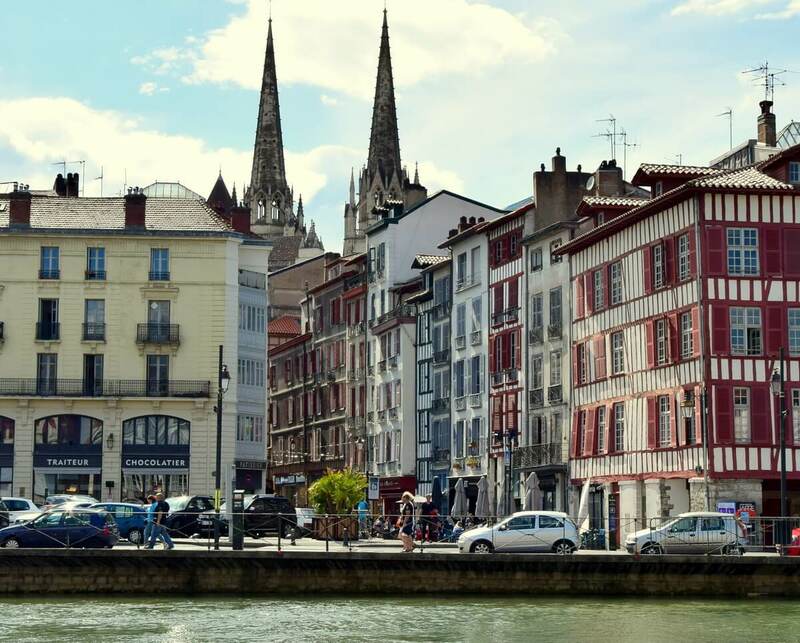 So follow me throughout this article, where I tell you everything about the chocolate days and the 9 reasons to visit Bayonne at that period. The Bayonne Chocolate Festival took place in 2018 on 11th and 12th May and for the first time the town has celebrated its chocolate again from 2nd to 4th November with “Bayonne fête son chocolat”. During the chocolate days, Bayonne lives to the rhythm of traditional Basque music, the taste and smell of homemade chocolate. And it’s always a huge success. The first edition of “Bayonne fête le chocolat” last November was very different and I’ll tell you why and about what. 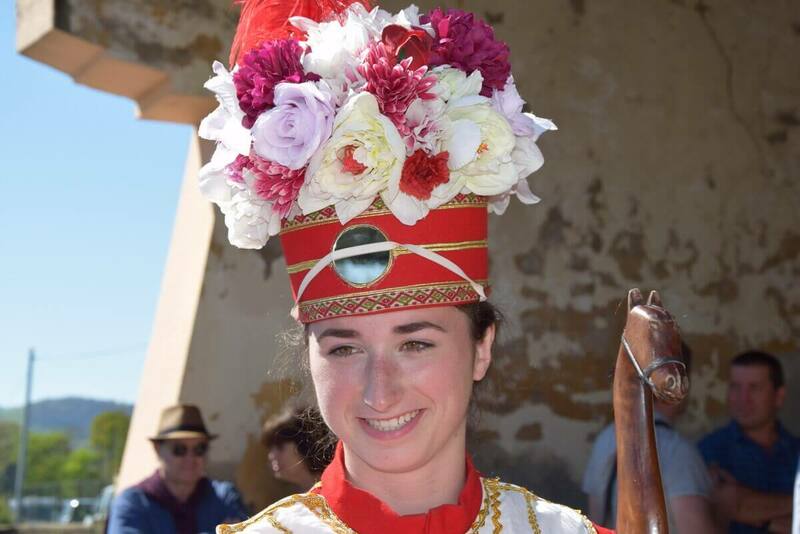 For 2019, it will certainly be again during the Ascension weekend starting on the 30th of May, on the occasion of “Bayonne fait le pont”. We don’t know yet if Bayonne fête son chocolat will occur in 2019 and how the two events will be mixed. For more traditional festivals in the Basque Country, don’t miss my guide to 80+ events, including the 2019’s dates, description, videos and tips. You need a vacation rental in the area? Reason 1: Bayonne is the French capital of chocolate. Reason 2: You will see the craftsmen at work. Reason 3: You will try to make your own chocolate. Reason 4: You will learn the chocolate making process. 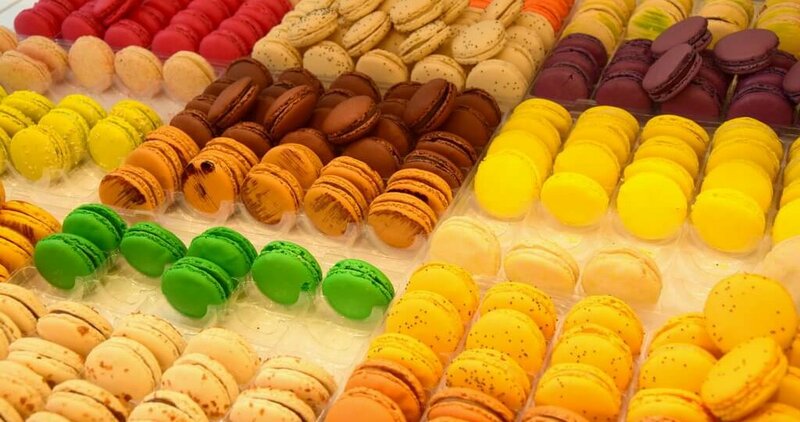 Reason 5: You will taste chocolates, macaroons and other delicious specialities for free. Reason 6: Visit Bayonne, the Venice of the Basque Country. Reason 7: You will discover other Basque traditions in the occasion of a longer festival. Reason 8: You will wander among the most typical Basque shops in the area. Reason 9: You will have a hot chocolate break at Cazenave’s. My feedback on 2018’s Bayonne celebrates its chocolate. Where to eat in Bayonne? Contact me through the contact page, the form or my phone number at the bottom of the page. The concept of my vacation rental is to help you to discover the Basque Country as a local, by giving you all the information you need but also some tips on the places and traditions only a few locals know. See the description of the flat for 5 persons, on the ground floor of my house and inside a 2 500m² orchard here. This may seem surprising, but people often ignore that Bayonne was the first city where chocolate was introduced in France. We talk about the famous Bayonne ham, the Espelette chilli pepper, and the Basque cake; but the chocolate will often be forgotten! During the 16th century, Jews fleeing the Inquisition settled in Bayonne, in the Holy Spirit district, where a synagogue can still be found near the railway station. They’re the ones who brought chocolate into town. The country really discovered this product in 1615, during the marriage of the Spanish Infanta Anne of Austria and Louis XIII. At its best, Bayonne had 31 chocolate factories. Today, 7 famous chocolate houses maintain the tradition. This is the main reason why the Bayonne Chocolate Festival is THE chocolate festival to celebrate in France! It should be noted that the 1st edition of Bayonne fête son chocolat (Bayonne celebrates its chocolate) was more focused on the history of chocolate. For the occasion, the synagogue was part of the explanatory itinerary and one could therefore visit its interior. Let’s hope that this possibility will be maintained during the next chocolate festival. The Master chocolatiers of Bayonne do not only prepare delicious chocolates. 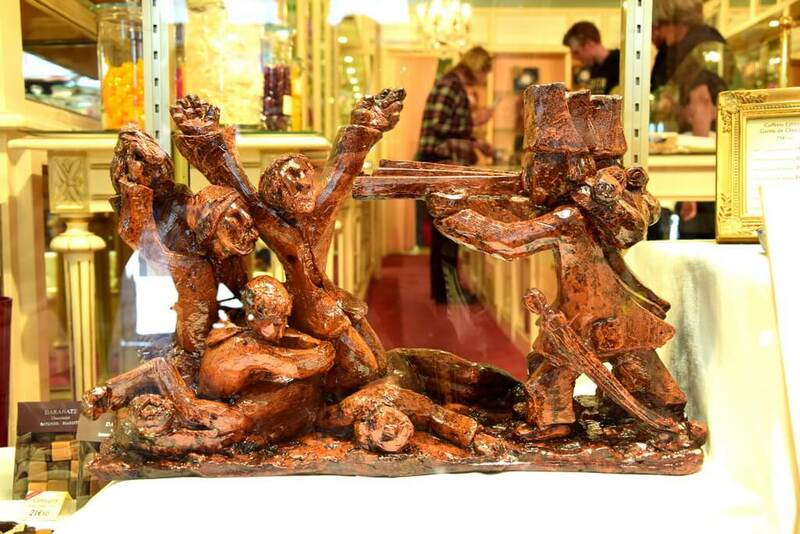 They are also experts in the sculpture of magnificent works of art in chocolate. During Bayonne Chocolate Festival, they show their work, but also exercise their talent directly in the street in front of their shop. Unfortunately, this animation was not offered as part of Bayonne fête son chocolat. I found it really unfortunate because it is in my opinion the demonstrations and tastings that make the charm of the chocolate days and give them that festive touch. Can you imagine yourself as a master chocolatier? You will be able to live this dream at Bayonne Chocolate Festival! 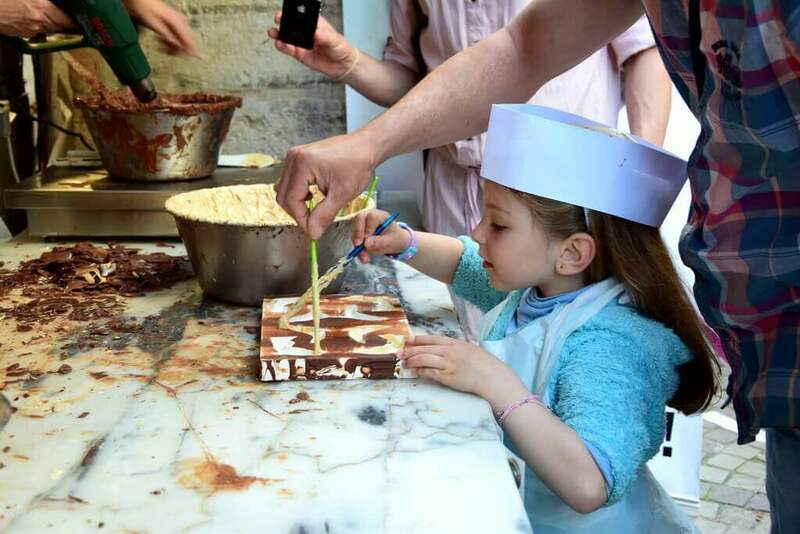 While your children are wearing the Master Chocolatier’s clothes, you will help them prepare their own chocolates in front of the youngest enjoying licking her hands. During Bayonne celebrates its chocolate, this animation was offered on certain days, on registration, in the beautiful Caveau des Augustins. Short demonstrations in the street and longer workshops in the largest chocolate factories are offered free of charge during the two days. 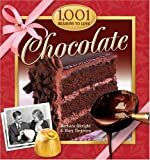 You will learn not only how to make your own chocolates, but also the history, transport and processing of cocoa beans. As part of Bayonne celebrates its chocolate, I really regretted the lack of friendliness and entertainment on some of the stands on the tour. The most “lively” activities were all centred around the Town Hall. Let’s be honest: this is most people’s favourite activity during the chocolate festival, and the main reason they attend. The chocolate factories that officially participate in the festival offer their chocolates in the street. Most of them are located on Port-Neuf Street. But other shops, such as that of Thierry Bamas, world champion in frozen desserts and best pastry chef in France, offer to try other specialities. If you notice a long line in the street in front of a store, you know you have something to taste! The big downside of Bayonne is celebrating its chocolate! We were able to discover the crushed bean, the melted cocoa “raw” (bitter) and as it was drunk at the King’s Court (spicy and unsweetened). Although we appreciated this original discovery, we regretted the lack of tasting of the chocolate makers’ specialities. The Basque Museum nevertheless offered a chocolate fountain, where we could taste kebabs with artisanal marshmallow, orange peel and artisanal praline (1€ per kebab). Another commune in the Basque Country is nicknamed the Venice of the Basque Country. This is Saint Jean Pied de Port. But if we look at the story a little closer, we quickly realize that Bayonne deserves the title. Indeed, until the 17th century, the small city really looked like Venice. It was crossed by canals, traces of which can still be seen through the presence of houses on stilts, including Port-Neuf Street or Quai Galuperie. The name “Port-Neuf” reflects the canal past of this street. The canals were used in particular for trade. Bayonne is built where the Adour meets its tributary, the Nive. In 2016, the festival of crafts was held in the cloister of the cathedral at the same time as the chocolate days. In 2017, it took place from 4 to 27 August. The cathedral, built during the 13th and 14th centuries, is one of the sites listed by UNESCO (in the subcategory of the Way of Compostela). The cloister is one of the largest in France. I strongly advise you to visit it. 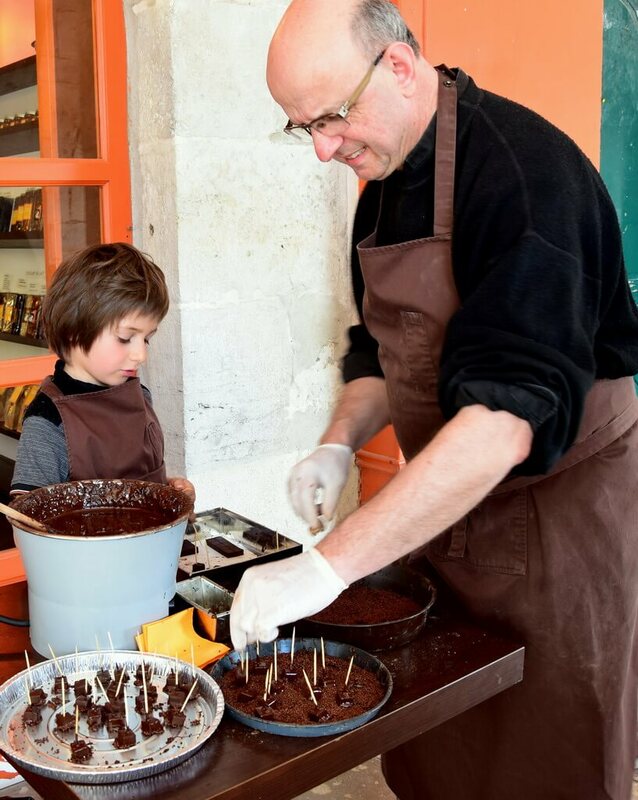 In 2017 for the first time “Bayonne fait le pont” took place, a 4-day festival highlighting the river Nive, the river Adour and the old centre, with activities around chocolate. It became the Ascension Festival. In 2019, the chocolate days should therefore take place on Friday and Saturday of the Ascension weekend. Bayonne is one of the most suitable cities to enjoy the typical atmosphere of the Basque shops. The architecture of the houses, the pedestrian streets and the Vauban ramparts offer the perfect setting for a medieval Basque atmosphere. The city also offers a medieval festival and market during the summer season! 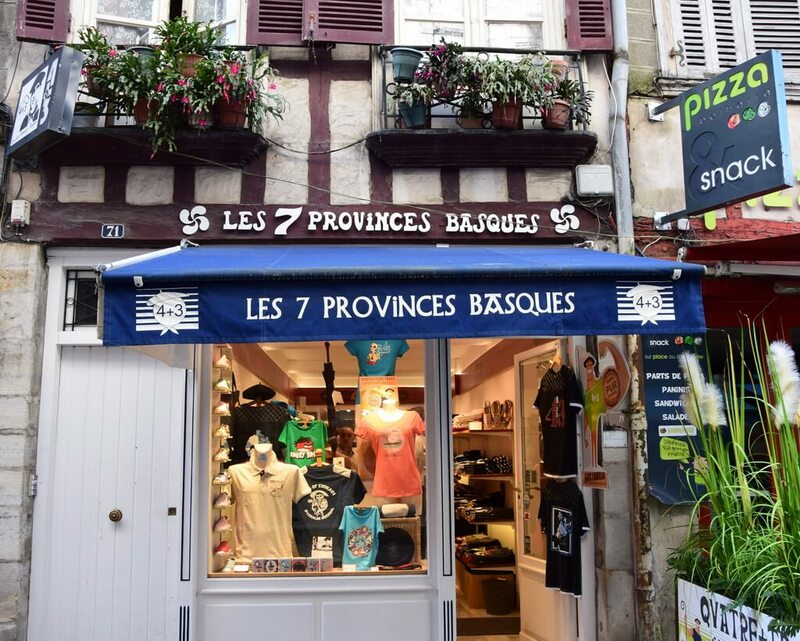 You will find several delicatessens and shops to buy the famous Bayonne ham, Basque fabrics and clothing, some Basque cafés, the traditional market where you can eat local specialties, many souvenir shops, etc. The Bayonne chocolate festival would not be complete without the traditional Basque music I recorded there. 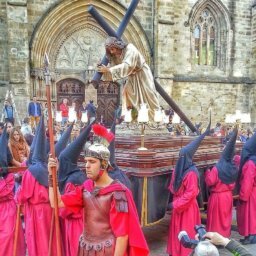 In 2018, the bandas, called here txarangas, were not present during Bayonne celebrates its chocolate. Nevertheless, we were able to enjoy another very festive moment, since for the first time Koruak, the first edition of the international choir festival, took place. International choirs performed in the streets on Friday, Bayonne choirs on Saturday, with a very beautiful common finale at the cathedral. Located on Rue Port Neuf under the famous Bayonne arcades of houses on stilts, this tea room is the best place to enjoy a frothy hot chocolate. The environment is magnificent, whether outside under the arcades of the pedestrian street, or inside in the middle of mirrors and stained glass. The chocolate is topped by a frothy cloud mounted by hand according to an ancient technique and served in porcelain tableware decorated with roses. I went to Bayonne on Saturday afternoon for the choir finale at the cathedral. Once the final was finished, I went to several sites in Bayonne celebrates its chocolate: those of the Town Hall, the market halls and the Augustins’ cellar. I found the atmosphere sad and not very friendly. Not surprisingly, when I told the group that I had to take to the festival on Sunday afternoon that there were no tastings or musical events, many decided not to come. 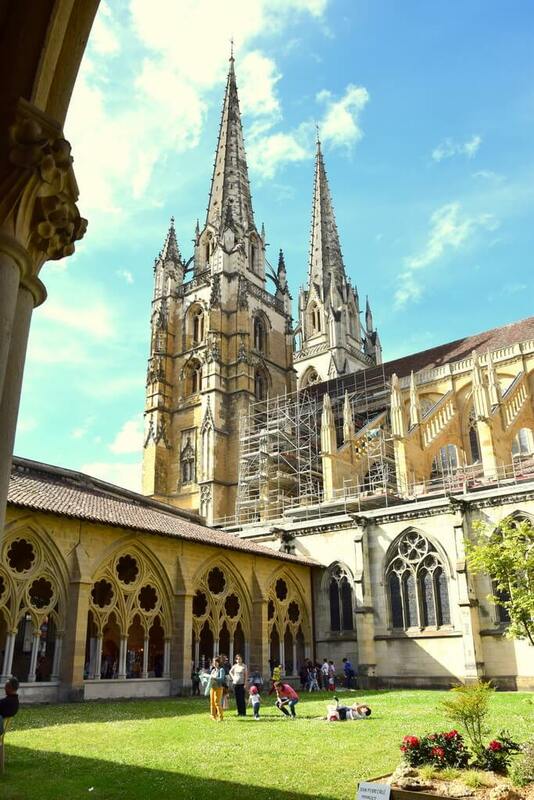 The next day, however, our small group enjoyed being able to taste the “raw” cocoa, discover the manufacturing process, visit the synagogue, stroll through the streets of Bayonne under the sun and finish with a sparkling chocolate under the arcades at Cazenave. – a gourmet all-chocolate lunch on Sundays. The closest airport is in Biarritz where you can find some busses to Bayonne centre. Depending on where you come from, I recommend you to use my favourite airline company, Qatar Airways, or the Skyscanner’s search to find the best deals. The closest railway station is in the centre of Bayonne directly so you won’t need any car if you only want to visit Bayonne, Biarritz and Saint Jean de Luz. There are several TGV from/to Paris and regional trains between these cities. Don’t miss the Rôtisserie du Roy Léon!!! Everything is perfect: delicious, beautifully presented and extremely copious dishes, a warm atmosphere and welcome, a wine to fall on the ground, the Roy Léon version of the Gascon aperitif, the Pousse-Rapière. If you only need to try one address in Bayonne, it’s this one! Click here to view the menu and book your table at no extra cost. 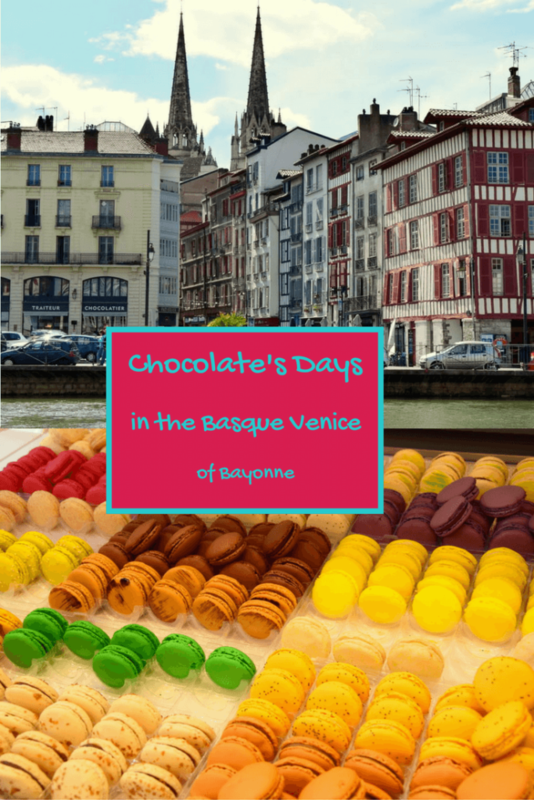 I hope you enjoyed this original discovery of a Basque city through one of its festivals and I convinced you to visit Bayonne during the chocolate Days! Are you ready to come celebrate the chocolate days with us? For other ideas on the coolest places to visit in the Basque country, read Justine’s guide on the best cities in Spain where 3 of the 9 suggestions are in the Basque Country or very close in Asturias. Will you recognize which ones? Read also the other articles in the Basque Country Landes section here. This article may contain compensated links. Disclaimer: As an Amazon Associate I earn from qualifying purchases. Read our disclosure policy to know more.